The perfect starter set, International Silver’s Adventure Collection 51-piece set includes service for 8 and a 3-piece hostess set in versatile stainless steel with classic styling. 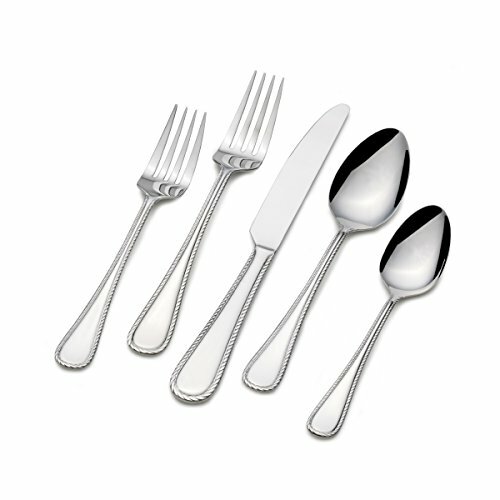 This 51 piece set includes eight of each: salad forks, dinner forks, dinner knives, dinner spoons and teaspoons. This set also includes 1 tablespoon, 1 pierced tablespoon, 1 cold meat fork and 8 extra teaspoons. Dishwasher safe and never needs polishing. FULL SET OF SILVERWARE INCLUDED: This set of flatware includes a set of 8 each: salad forks, dinner forks, dinner knives, dinner spoons, teaspoons, 1 tablespoon, 1 pierced tablespoon, 1 cold meat fork, 8 extra teaspoons.